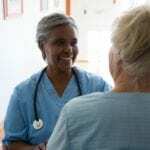 The U.S. Department of Labor projects that nurse aide jobs for certified individuals will remain one of the fastest growing professions through the year 2022. The Labor Department’s predictions contribute in part to the popularity of nurse aide training programs across the United States. Community colleges, universities, adult education programs, and high schools report increased enrollment in this particular program as high school students use the entry-level training as a stepping stone to a career in the health industry. Adults looking to change their careers or those who have been laid off from other industries also find countless job opportunities after training to become Certified Nurse Assistants. In Knoxville, Tennessee, training programs offer a minimum of 75 contact hours, including clinical and theoretical training. Upon completion of the program, graduates are eligible to challenge the state exam, administered by D&S Diversified Technologies, and obtain their certification to work legally within the state. The training at Compassionate Care Technical Center teaches students how to assist patients and residents in a clinical setting. The licensed nurse instructors facilitate the theory and lab before transferring students to a clinical facility where they learn via hands-on procedures. The entire program prepares students for the state exam and an entry-level position in the field. The program requires 96 hours of instruction: 78 hours in the classroom and 18 clinical hours. Applicants must have a high school diploma or GED. Applicants with no high school diploma must take the Ability to Benefit Test to enroll in the program. Tuition for the program is $700.00 inclusive of the registration fee, nurse assistant handbook, student ID and liability insurance. Other expenses include the state board exam fee ($80), uniform, pressure cuff, stethoscope, gait belt and watch with a second hand. A flexible payment plan is available to all students. Graduates are eligible to take the state exam at Compassionate Care’s approved facility. Instructors at Tennessee College of Applied Technology teach nurse assistant students how to provide direct care to patients. At the end of the training, graduates find opportunities for employment at hospitals, nursing homes, assisted living facilities, home health agencies, and hospice. Course content includes infection control, basic restorative services, patient rights, emergency and safety procedures, communication skills, interpersonal skills, cognitive dementias/impairment education, and personal care skills. The course also includes CPR training. All applicants must fill out a registration card, provide an official, sealed background check from the Sheriff’s Office (at least two weeks before the first day of classes), and purchase uniforms, which must be worn on the first day of classes. Applicants have the choice of attending morning or evening schedules. Day classes meet from 8:00 am to 3:00 pm Monday to Friday for approximately three weeks. Evening sessions are from 5:30 pm to 9:00 pm for 8 weeks. After the 120-hour training, graduates are eligible to sit the state exam. The training also awards graduates with 10 points that can be applied to the Practical Nursing Program. The estimated cost of the program is $720 including tuition, textbook and supplies. Financial aid is not available for this program. The CNA program at Goodwill Industries prepares students to pass the state certification exam and obtain entry-level employment in the healthcare industry. The program, facilitated by a Registered Nurse (RN), provides 164 hours of classroom and clinical instruction. During the course of the training, students learn how to perform critical tasks such as taking vital signs, obtain lab specimen, observation and reporting, and assisting patient with routine activities. During the clinical training, students transfer from the classroom to an off-site location for two weeks of practical training supervised by RN instructor. The clinical experience gives students the opportunity to put their classroom learning into practice. Tuition for the program is $600 plus $90 for the state board exam. Scholarship opportunities may be available for those who qualify. Prospective students must attend a mandatory information session before enrolling in the nurse aide training offered by the Red Cross. Sessions occur every Wednesday at 10:00 am and give individuals the chance to ask questions related to the program and nurse assisting in general. Night, weekend, and intensive classes are available based on demand. Applicants must take the TABE (reading and math assessment) or provide of high school diploma, pass a Red Cross criminal background check, and complete a Red Cross physical form/ TB test. The curriculum includes classroom lessons combined with field experience to reinforce theoretical concepts. Classroom topics include infection control, range of motion, vital signs, communication, teamwork, promoting safety, the art of caregiving, special care, and transitioning from student to employee. The cost of participation in the program is $1,250. The cost includes the course textbook, 2-year CPR, First Aid and AED, job fair with local employers, resume workshop, special tutoring, and graduation costs.